From the late nineteenth century through the post-Holocaust era, the world was divided between countries that tried to expel their Jewish populations and those that refused to let them in. The plight of these traumatized refugees inspired numerous proposals for Jewish states. Jews and Christians, authors and adventurers, politicians and playwrights, and rabbis and revolutionaries all worked to carve out autonomous Jewish territories in remote and often hostile locations across the globe. The would-be founding fathers of these imaginary Zions dispatched scientific expeditions to far-flung regions and filed reports on the dream states they planned to create. 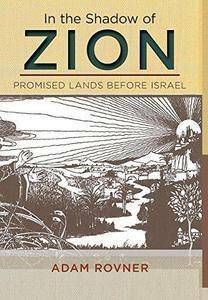 But only Israel emerged from dream to reality. Israel’s successful foundation has long obscured the fact that eminent Jewish figures, including Zionism’s prophet, Theodor Herzl, seriously considered establishing enclaves beyond the Middle East. In the Shadow of Zion brings to life the amazing true stories of six exotic visions of a Jewish national home outside of the biblical land of Israel. 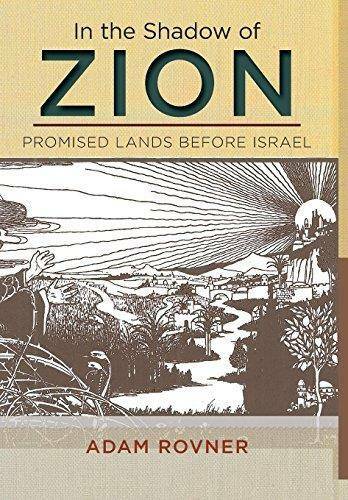 It is the only book to detail the connections between these schemes, which in turn explain the trajectory of modern Zionism. A gripping narrative drawn from archives the world over, In the Shadow of Zion recovers the mostly forgotten history of the Jewish territorialist movement, and the stories of the fascinating but now obscure figures who championed it. Provocative, thoroughly researched, and written to appeal to a broad audience, In the Shadow of Zion offers a timely perspective on Jewish power and powerlessness. Visit the author's website: http://www.adamrovner.com/.